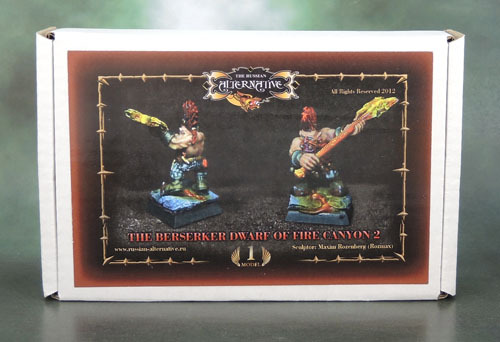 Review: Russian Alternative – The Berserker Dwarf of Fire Canyon #1 and #2 | Azazel's Bitz Box. 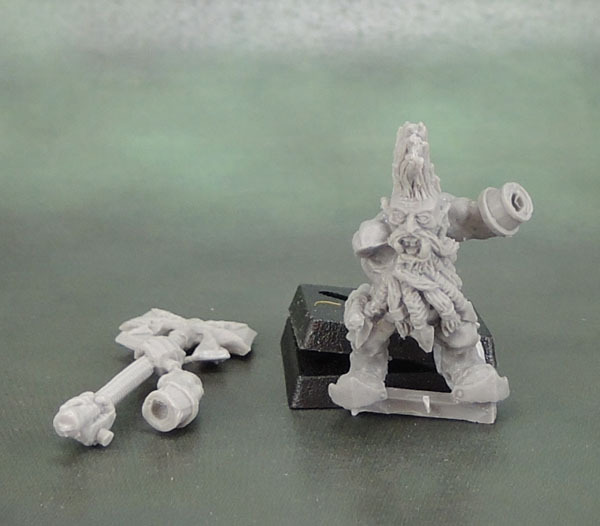 About a month or so ago, I ordered a pile of Dwarfs from Russian Alternative via their eBay store. Mostly Chaos Dwarfs, the line being called “Fire Canyon”, and also a few of their “Regular” Dwarf line. 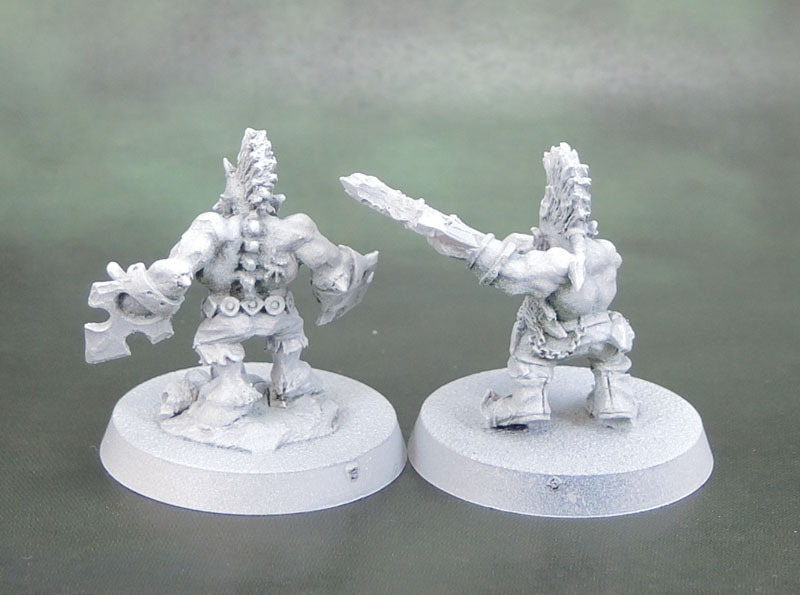 Today, I’m giving an overview of the first two of the models, which I’ve just gotten ready for painting. As with all of my reviews, I purchased the products myself and there’s no quid pro quo going on here in exchange for a favourable review. 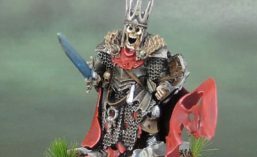 I know I always appreciate being able to see clear photographs of models I’m considering purchasing, and it can be much harder to find that when we’re looking at non-Citadel product. 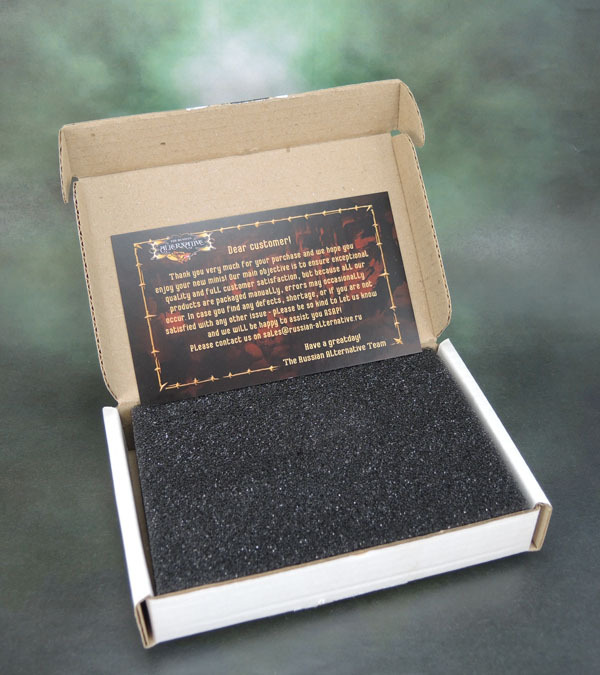 RA’s models all come inside a thin cardboard box, with a colour photograph on the front of the model inside. Sealed by a RA sticker which I guess also functions as a form of security sticker in the retail environment, the “plastic” sticker on the back refers to resin (which is a kind of plastic) as opposed to HIPS or ABS or Restic or any of the other plastics that we wargamers are accustomed to. Inside, the figure is protected by being sandwiched between two layers of foam. I really like this. It’s not as “pretty” as a blister pack, but I’ve received SO many resin models from a variety of companies that have had the figures arrive damaged simply from bouncing around in a blister, with components smacking into each other. It’s simple, but the secure fit these figures had by being packaged in such a way is a big positive for me, especially as I buy so much of my stuff online. There’s also a little “thank you” card inside that provides contact details in case you have a miscast item or any issues. Russian Alternative’s models used to be made soley in metal. 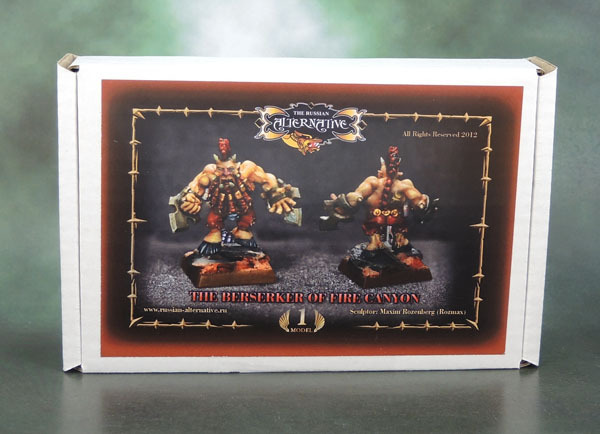 In fact, many of the models I purchased were also available as metals, but I went entirely for resin with this order, one of the reasons being that their resin is extremely competitively priced. The sculpted detail is fine and, well, detailed. Certainly on a par with Forge World, for a fraction of the price. Very clean casts with almost no flash and minimal mold lines. 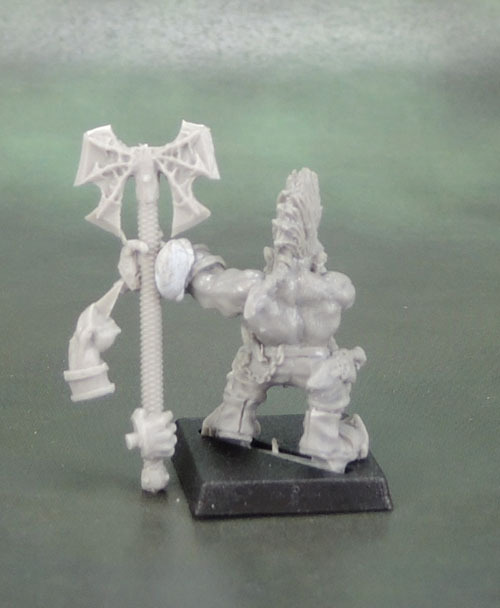 One of the two Berserker heroes – the one with the greataxe – came with a slotta that fitted into the provided base, the other model – armed with hand blades – did not, and in fact his hooved feet aren’t even flat and don’t rest on the ground evenly. He’d need to be mounted differently, or have the heat treatment in order to flatten his stance. Being resin, both figures got a soak in dishwashing liquid and a scrub in order to remove any mould release. There was a bit of sheen left in parts of the models, and so to be safe I gave both a coat of watered down Citadel Liquid Greenstuff. As I prefer the aesthetics of round bases, they both got those instead of squares, and as heroes, I gave them 32mm bases instead of 25mm ones. 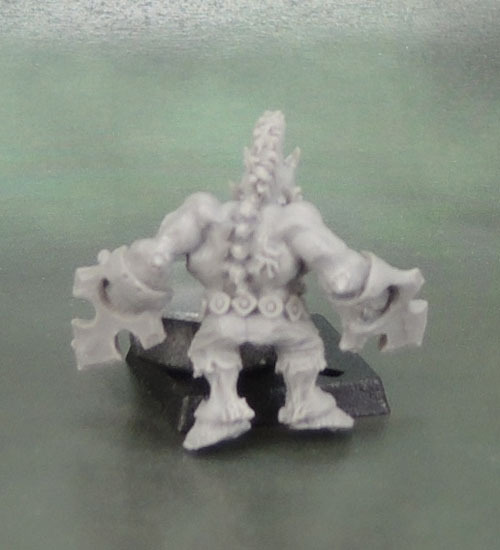 I didn’t want to heat treat his legs, and so Berserker #1 got mounted onto a blob of greenstuff with super glue (and I smushed some skulls into it for good measure) and his friend simply had his tab clipped off and was superglued down. The separate arm and greataxe fit pretty well (I accidently clipped off more than I sould have from his arm – but I was able to fill the gap with putty. I then primed with grey and then zenithally primed with white. I did forget to glue some slate to their bases, so that’ll be next, then it’s time to paint! I’m very happy with these models. 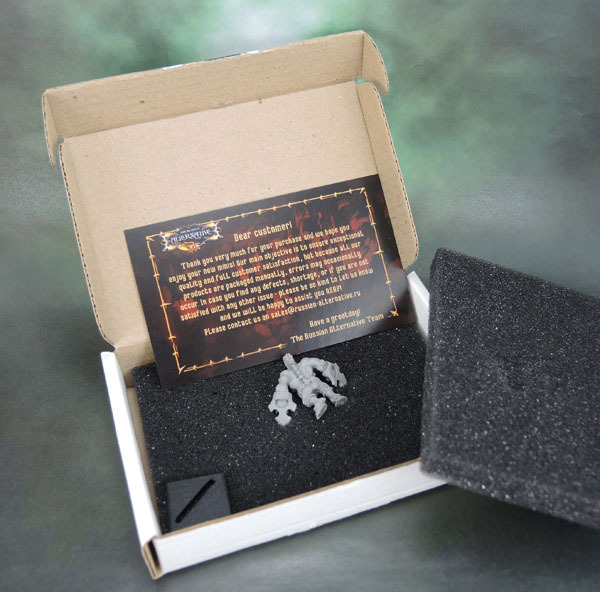 The price was very reasonable, service was good, shipping fast, packaging safe and the models themselves are very nice. I’ve got a ton more of these to work through, and I honestly haven’t even opened any of the others yet. I figure I’ll try and work my way through these guys and paint them as I go. I might even get them all done by the end of the year! These two will slot in with the many Dwarf Slayers I’ve been painting this year, and so hopefully I’ll have the finished product to share in a week or two. Wish me luck! 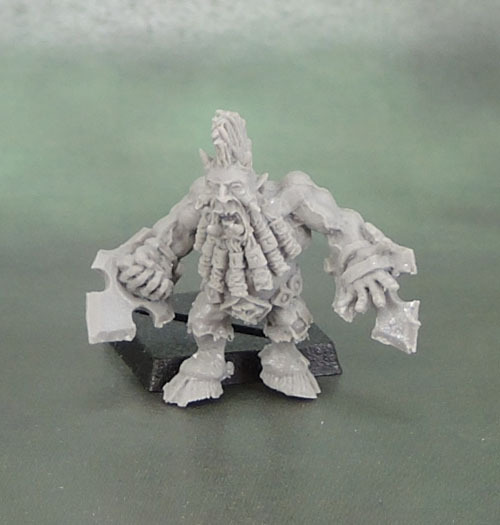 This entry was posted in Age of Sigmar, Chaos Dwarf Army, Warhammer Fantasy - 9th Age and tagged Berserker Dwarf, Berserker of Fire Canyon, Chaos Dwarf, Dwarf of Fire Canyon, review, Russian Alternative. Bookmark the permalink. These are really cool. I’ve looked at their gear before. Some very nice minis. I have to say, if you like the sculpts and don’t mind dealing with resin or metal, they’re worth grabbing a few of. Thanks mate. I’ve started painting these two. 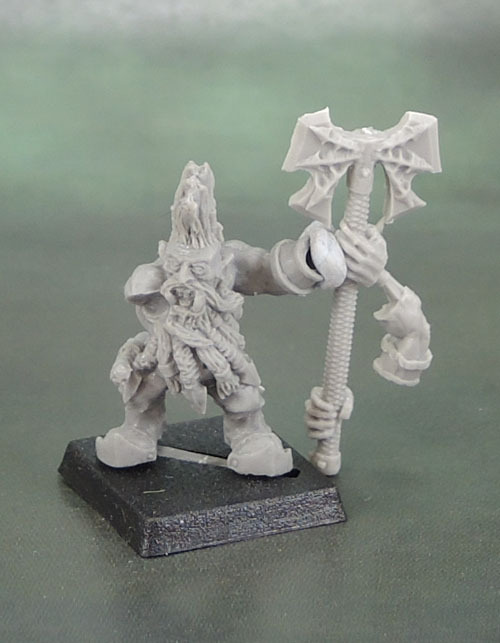 Going to follow on with the overall Slayer theme, but with a few tweaks to how I do the non-chaos dwarf rather than differences. 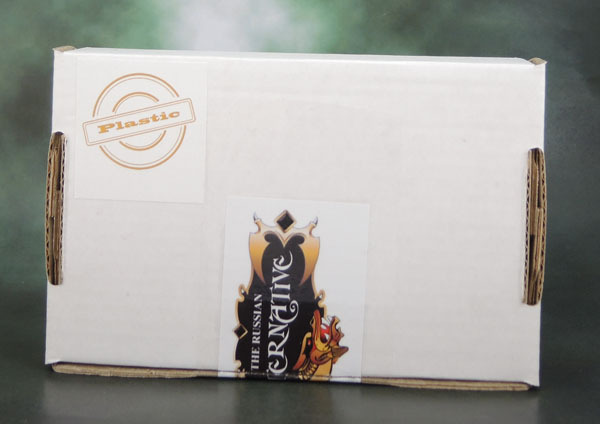 Thanks for the detailed review, always good to see how things look out of the box and (particularly with resin and metal) how well they’re packed. Size wise I assume they match the modern GW scale? Pretty much, but a good question nonetheless that I somehow didn’t think of at the time. 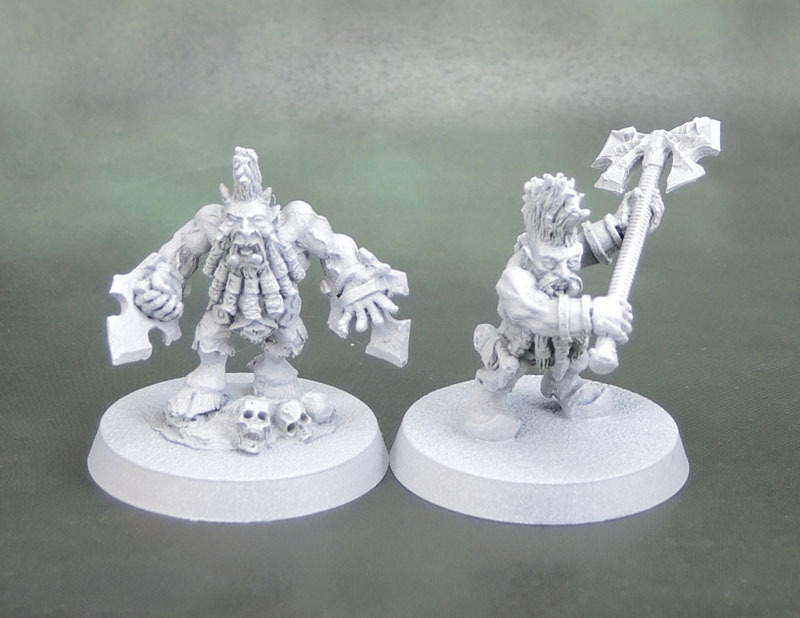 When I next show them (painted), I’ll put them into a line-up with some other Dwarfs and Chaos Dwarfs.